Stefan Klaassen new Head of Sales and After Sales at Bavaria Yachtbau Stefan Klaassen has taken over the role as new Head of Sales and After Sales at Bavaria Yachtbau with effect 1st July 2016. Mr. Klaassen takes the lead of Bavaria's sales team and will be responsible for the entire sales of sail, power boats and catamarans. Stefan Klaassen previously worked as International Sales Manager EMEA at Navico and was successfully leading the boat builder segment, where he also developed the international dealer and distributor network. The 37-year-old gathered many years of experience in the marine industry and in different companies at management level. With this recruit Bavaria Yachtbau completes its management team for further growth and is well positioned for its future sales targets. Bespoke products, reflecting the preferences and the personality of their owner, offered with an innovative approach. These are the messages conveyed by the new advertising campaign by CRN, Ferretti Group’s Italian brand and shipyard specialising in the construction of 45 to 100 metre, steel and aluminium mega yachts. The campaign centres on the claim “We reinvented the idea of Bespoke”, expressing the brand’s focus on craftsmanship and style and representing the true added value of products designed & made in Italy. The claim highlights the essence of the shipyard’s role: taking the wishes of its well-informed and demanding customers, and giving them a tangible form with no limits. Like a genuine atelier, where customers come to get a suit made to measure, CRN has re-invented a new way of building tailor-made yachts with the same approach as a master tailor. Each customer has their own specific measurements and needs, and no “suit” should ever be the same as another, even if they are made by the same hand. The superyachts built by CRN reflect the vision of their owners, matching their personal taste and style while fulfilling specific needs and desires. The yachts are the true protagonists in the new campaign designed by Milan’s Savile Row agency with creative director Lorenzo Cascino, seen to be fully-customised icons for people who expect to stand out from the crowd with a fully-customized pleasure vessel, a unique example designed by CRN’s Bespoke Atelier. Each of the shipyard’s yacht is a unique work of art, expressing the vision described by the owner, before being a recognisable member of the CRN fleet. All the yachts in the fleet are a combination of a flexible approach and a sense of passion. The 55 metre M/Y Atlante, the latest to be built by CRN, is the perfect example of this. It’s strong style and personality embodies the Bespoke model of the brand to perfection. CRN’s ‘We Reinvented the Idea of Bespoke’ campaign will feature in selected off line media and in the brand’s social media channels starting in July 2016. Hatteras Hatterascal flagship GT70, boated a 182.4-pound yellowfin tuna that broke the species record for the Blue Marlin Grand Championship of the Gulf, hosted by The Wharf in Orange Beach, Alabama, on July 12-17. Team Hatterascal, with angler J.P. Arceneaux on the rod, won first place in the tournament's tuna division, earning a check for $53,550. Palumbo Group S.p.A. has learned, with great satisfaction, that the Court of Ancona, after the conclusion of bidding procedures, has authorized the transfer of the ISA organization via the acceptance of the irrevocable offer on the part of Palumbo Group. While awaiting the finalization of the transfer, Palumbo Group is preparing all that is necessary for the reopening of the Shipyard in Ancona and the go-ahead for all production and collateral activities at the aforementioned site. There were 18 Jarrett Bay custom builds fishing the recent Big Rock Blue Marlin Tournament. No matter where you are this tournament season in the Mid-Atlantic or on the Gulf Coast, chances are you will see a Jarrett Bay out there! The one-day Keli Wagner Lady Angler Tournament saw 125 boats fishing, and through all of the gamefish weighed at the end of the tournament, the women aboard the 55′ Jarrett Bay Inspiration clinched the top dolphin prize with a 31.2 pound fish reeled in by Jeannie Fischler. This catch helped land them a nice check for $49,725 during the evening’s award banquet. The 58th Annual Big Rock Blue Marlin Tournament saw an impressive 174 boats fishing throughout the 6 days of the tournament. The action was non-stop each day with multiple blue marlin being brought to the scale causing several shake-ups in the leader board throughout the week. However, one catch stood strong throughout the week-long tournament: on Day 2 Inspiration‘s Trent Ragland reeled in a 49.3 pound mahi mahi to clinch first place in the winner-take-all dolphin category and earn a sweet $130,050 payout. Congratulations to all the Captains, crews and anglers that make the Barta Boys and& Girls Club Billfish Tournament such a special event. Of the Jarrett Bay boats participating, Bill Collector took third overall, Marlin Fever took second place tuna and junior anglers from Inspiration, Builder's Choice, Sensation and Reel Easy were all recognized for their accomplishments! After 27 years of family fun, competition, celebration and bragging rights the scales have now been closed for the last time to end an era, Viking Ocean's Final Showdown. This very special tournament grew out of these two manufacturers whose close proximity to each other in Southern New Jersey has literally defined Mid-Atlantic sportfishing. And what a party it was! Both Team Viking and Team Ocean had a ball and enjoyed fishing, fabulous food, live music and dancing and of course, the famous Canyon Club Resort Marina pool party barbecue with management working the feast behind the grills. Although fishing was slow on the first day, the bite picked up and bills were snapping. Dave Anderson and the Viking 70 Krazy Salt's team released seven whites to take Most Points Overall as well as Most Points White Marlin. Captain Brian Komer and the crew on the Viking 62 hit a grand slam by 10:30 am. Angler John Leek, IV hooked up a blue, awarding the team Most Points Blue Marlin. The team also added another sailfish and white marlin to the day. Judge, Marty Judge's Viking 64, rose to the top spot for Most Points Tuna as well as Judge angler Mike Lawrence weighing the heaviest tuna of the tournament, a 52 pounder. When the dust settled, Team Viking took the perpetual trophy home for the final time but it wasn't about the win, it was about two amazing companies and the best owners and vendors coming together and celebrating the last hurrah. Breathe Easy is the 2016 Gulf Coast Triple Crown Champion! The Viking 68 is owned by Matt McDonald and Captained by Patrick Ivie with mate Nick Knoepflein plus Shane Tool and Ryan Fields as additional crew. The Triple Crown consists of five events in the central Gulf of Mexico and has a hybrid scoring system that includes both weigh and release points for the top three finishes in the blue marlin division. Breathe Easy placed second in the Orange Beach Billfish Classic, third in the Cajun Canyons Billfish Classic and second in the Emerald Coast Blue Marlin Classic with an 835 pound blue less than three pounds shy of first place. Sherry and Buell Polk, owners of Share-E, a brand new Viking 72 run by Captain Mike Roberto made a late charge at the Crown by weighing a 652.8 blue at the Blue Marlin Grand Championship. This fish solidified their Second Place standings. Last year's runner up, Rise Up came in Third Place this year. The Viking 54 is owned by Rusty Skalla and captained by Jason Hallmark. Amongst a field of 61 boats, Pour Intentions, a Viking 56 was named the Second Place Tournament Boat at the Blue Marlin Grand Championship. Pour Intentions released two blue marlin early in the tournament and decided to take their third blue to the scales which weighed it in at 455.6 pounds. In addition, Pour Intentions Captain Hunter Forbes (the youngest captain in the fleet at 23 years old) received the Top Captain title. This tournament is the fifth and final leg of the Gulf Coast Triple Crown Championship series and is an invitation only event. Sherry Polk, guided by Captain Mike Roberto on the brand new Viking 72 Share-E captured a 652.8 pound blue that was good for Third Place Tournament Boat and Top Lady Angler. Sherry and her husband Buell took delivery of the boat a week prior to the event and ran several hundred miles to the tournament to christen the boat in with a big fish! Conundrum, Daniel Haeuser's Viking 61, was the Top Release Boat with three blue and one white marlin. All three of Conundrum's blues exceeded the minimum length but Captain Jimmy Crochet and the crew opted to release them. Angler Doyle Jefcoat, fishing on Southern Miss, a Viking 61 run by Adam Ladnier boated the top wahoo of the week with a 74.6 pounder. Wes Mincin on the Viking 92 A Work of Art claimed Third Place Wahoo with a 59 pound fish. Laurie Jones fishing the Viking 56 Reel Addiction took Second Place Tuna with a 180.2 pound yellowfin. The beautiful battlewagons made their way out of the small jetties at this year's edition of the Lone Star Shootout. When the boats headed back in the final day it was Viking that led the fleet. Travis and Jackie Hunter's Viking 65 Backlash had a field day claiming five spots on the leaderboard. Four blues, a white and one sailfish clinched the Top Release Boat for Backlash. Backlash angler Hunter Oglesby had the biggest wahoo weighing in at 54.5 pounds while teammate Michael Oglesby had the Second Place Tuna. Captain Travis accepted the Top Captain Award and Michael Oglesby took the Top Mate. The biggest blue marlin of the event was boated by Perry Forrester fishing on his Viking 66 Slight Edge. Captain Bret Hawes took the fish to the scales at 442.5 pounds. Second Place Blue Marlin went to Derek Elzner fishing his Viking 61 Over The Limit. Top tuna went to Jeff Pachaceh with a 162.5 pound fish. Jeff fished on Bobby Walters Viking 61 Down Time. Third Place Tuna was awarded to Richard Wright on Martin Clemont's Viking 55 Vamanos.Vamanos angler Kolby Scott was named Top Junior Angler. Third Place Wahoo was a 46 pound fish caught by Kade Miller on Wade Miller's Viking 52 Leveled Up. The Viking 68, Marquesa, took top honors in the first ever Gamefish Grande Championship in Varadero, Cuba, the end of June. Marquesa, based in Wrightsville Beach, North Carolina, released five blue marlin during the three day tournament to claim first Place Overall. Captain Charles Harris, along with mates Lawrence Morejon and Mikey Bethel also claimed Top Captain and Top Mate. Congratulations to angler and owner Steve Bolick, and anglers Stephen Bolick, Street Jones and Skip Jones. Viking are burning up the tournament trail this summer! At the recent Emerald Coast Vlue Marlin Classic they filled 12 of the 18 spots on the leader board and claimed $1.269 million of the $1.952 million prize money up for grabs. The big story of the event was the blue marlin category. Breathe Easy, Matt McDonald's Viking 68, was coming off a win at the Cajun Canyons Billfish Classic but Rusty Skalla and his team on the Viking 54 Rise Up had their eyes on the prize. Breathe Easy angler Chad Postle weighed a 835.8 pound blue marlin to earn the top spot on the board but Rise Up bumped them into second place by a mere 2.4 pounds. Captain Jason Hallmark put Rise Up angler Scott Poppell on a 838.2 pound blue that after a six hour fight went on to win the category. Kenny Tamm, fishing Mark Mathys' Viking 70 Marlin Darlin, set a new tournament record after boating a monster 190.6 yellowfin tuna with captain Matt Condon at the helm. Michael Rybovich and Sons presents its new World wide web showroom. Michael Rybovich and Sons was founded in 2010. As the surname says Michael is a direct descendant to the Rybovich legacy which was founded in 1919 by Astro-Hungarian immigrant John Senior. He is infact a third generation Rybovich son of Emil part of the second generation of Rybovich who along with brothers John and Tommy brought so much innovation and created the current sportfishing genre in the mid twentieth century, along with some other innovations as the use of Epoxy and the cold molding build technique. Currently Michael who is third generation is being followed by his son Dusty a graduate in Naval Architecture and Marine Engineering by the Webb Institute. Michael Rybovich aims to continue the family legacy and along with New Construction is also offering Service and Repair. Since starting operation Michael has delivered two custom new boats; a 64 feet in 2014, and following it with an 86 feet in 2015 this last being the largest ever build with the Rybovich name. Currently the yard is building hull number three which will be a 68 footer. Michael Rybovich and Sons new website takes you around with the following buttons; Home, History, Galleries, The Registry, In The Media, Contact, and Brokerage. At the bottom of the first Home page is also link to the social media facebook page of Michael Rybovich and Sons along with a link to the old Rybo Marine website which continued the Rybovich legacy from 1985 till 2003 and built hull numbers 108 to 121. Fiart showcase the project for a new 52 model, set to be launched in September 2016 and presented in Cannes boat show during the same month. The 52 when launched is to be the second in size for Fiart which today starts at 33 feet and ends with the 58 Epica flagship. The South Italy Neapolitan builder sees the 52 as a challenge to itself and to the market, and rightly so since Fiart has been known in Italy for making the perfect family sport cruiser for the Summer Mediterranean sea with classic models as the 35 and 40 Genius always having an important market share from the eighties up till today. Accommodation layout offers a three double cabin interior, and for the first time Fiart makes a fully enclosed main deck which when desired can become fully open thanks to a vanishing patio door system. As technical details go the 52 will have a complete new hull dedicated to the length, weight and propulsion of the sport yacht with a Vee shape featuring a 27 degrees angle at midships which closes to a medium 15 aft. Propulsion wise the 52 will use IPS pod drives as featured in three other Fiart models; 58 Epica, 4Seven Genius, 4TFour Genius. Fair note that Fiart has been among the first using IPS offering it as option on its 50 Genius flagship back in 2006, and after this going to fully dedicated models. Power wise the 52 will use twin Volvo 600hp or optional 725hp units coupled to IPS pods drives with a project estimated top speed of 37 knots with the largest engine choice. Absolute is already thinking 2017 season and has just finished its first new model for the coming year the new 50 Fly. Two hulls have already been completed of this new 50 Fly model, with the second hull being fitted with a hard top for the flybridge. The Absolute 50 Fly impresses for its accommodation in all areas for a yacht just short of fifty feet in over all length. Her accommodation layout proposes a three double cabin interior with full beam owners stateroom with en-suite, a VIP to fore, guest cabin to starboard with two inline berth, and a guest shared shower head. Impressive is also the en-suite shower head single berth crew or guest cabin aft. The living of the 50 Fly uses the recent Absolute layout of astern galley, and a C-shaped Lounge sofa which can also be used as a dinette. Power for the 50 Fly is a rather shy for the size twin Volvo 435hp with the tried and tested for the Italian builder IPS pod drives propulsion. Absolute is estimating a top speed of 30 knots with these rather small units for a 22 tons loaded flybridge yacht. With this new launch of a new flagship Otam has made again a statement to the way it approaches the market. Built of alloy and featuring three decks the new SD35 is a new kind of launch to the previously build 75 high performance sport cruisers and yachts from 45 to 80 feet Otam has delivered. Yet again Otam has again impressed, for its current largest build to date. The Italian builder in the build of this new flagship is also very proud of the all Italian nature for the SD35 from the designer to the builders. It will be interesting to see how Otam will feature in this market in the future. A builder from Rome had a similar pattern about a decade ago yet till today it only delivered one 140 feet triple deck super yacht, despite it being of good high quality. So the question comes automatic is the SD35 just a one off or we will see more of it from Otam. I think only the future will answer the question. Greenline presents the project for a new 36 Hybrid model with design again trusted to the Jakopin brothers of J and J office. The new 36 Hybrid is a further development of the Greenline concept and is to be an intermediate model between the best selling 33 and 40 models. 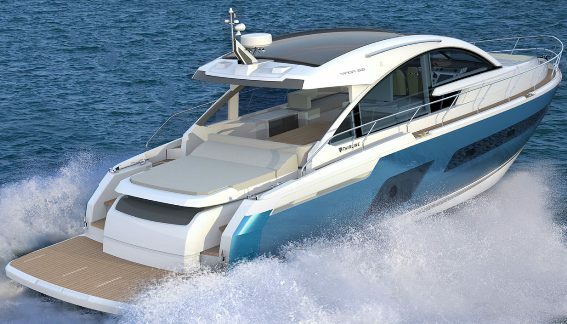 The 36 Hybrid aims to increase accommodation and speed to new levels for Greenline with a target to reach maximum speed of 25 knots with the large engine option of a Yanmar 370hp. Standard power is a Volvo 220hp which should reach eighteen knots max. Interior layout offers two cabins and one shower head below deck. While the main deck is center to the living area, with a C-shaped sofa, entertainment unit, and L-shape astern galley. Rizzardi continues its return phase and launches the 48 IN, an evolution of its best selling 45 Incredible model. As said in our Project article a few months back, the 48 improves the 45 with the addition of size in both length and beam. which makes for a larger cockpit deck, a crew cabin aft, and an interior with two available layouts modifying the size for galley and bathroom as one seems fit. Unlike the 2004 launched 45 Incredible, the 48 IN seems to be available only with surface drives on the official website. But do not be sure on this before getting a definite answer from Rizzardi guys, as the yard is known for its tailor made custom way of delivering boats. Fairline are currently finding its balance again, and here the British World famous name returns into producing new models and project. Set for launch in coming September 2016 the 53 Targa Open is the second evolution of the 53 GT as presented at the Southampton in 2015. As a striking difference to the GT the Targa 53 Open will feature uninterrupted entertaining above decks with a single level teak floor from cockpit to companionway. The boat incorporates a beautifully tapered hull glazing which emphasizes the dynamic character of the Targa concept and ensures that the spacious master cabin, lower galley and saloon below, are filled with natural light. Customers are also able to choose between a two or three cabin configuration that best suits their individual requirements. The cockpit boasts a spacious three person sun bed above the tender garage, large ‘U’ shaped cockpit seating with a wet bar opposite and spacious companion seating across from the helm, the perfect arrangement for maximizing enjoyment on-board. The Targa 53 Open will offer a choice of three shaft driven engines; Volvo 675hp or 725hp, and or Cats 850hp. All engine offer a minimum fully loaded speed in excess of 30 knots and a range of at least 300 nautical miles. There will also be the option to add stabilization, with the boat accepting both fin and gyroscopic stabilizers offering the highest level of comfort on-board. Ferretti Yachts is getting ready for the top boat shows in 2016, scheduling an important launch, confirming the dynamic mood and feeling of vitality that is flourishing at the company at the moment. 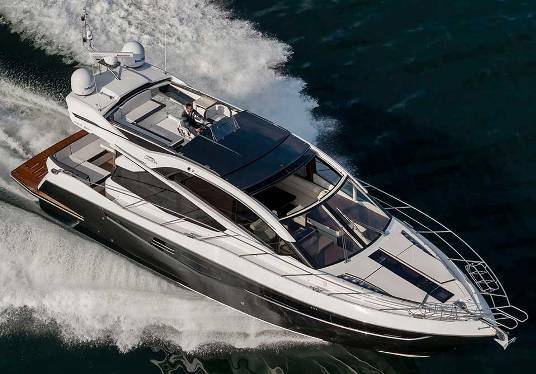 The very first Ferretti Yachts 850 was launched last Monday in Cattolica. The new flybridge pocket size super yacht is 26 meters long and is the epitome of how the largest yachts in the fleet have evolved, currently consisting of 10 models ranging from 45 to 96 feet. The Ferretti Yachts 850 is an icon of luxury, offering the unique experience of life in a magnificent maxi loft surrounded by the sea, and it’s just the latest extraordinary masterpiece in the history of a brand that goes back almost fifty years and has won the approval of the main international markets. So, it is no surprise that three of the new yachts have already been sold, two in Europe and one in the Americas: proof that it is already an unmitigated success. 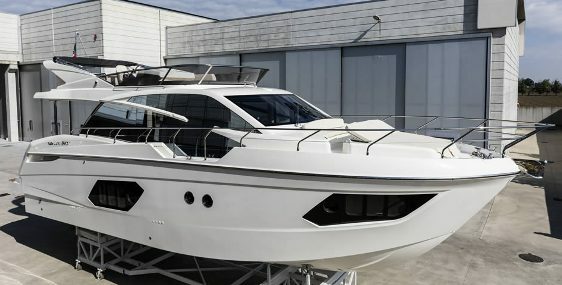 The Ferretti Yachts 850 is being built at the Cattolica shipyard and is the result of the joint efforts by Ferretti Group’s Product Strategy Committee, Studio Zuccon International Project for the design of the exteriors and the layout of the interiors and the Group’s Engineering Department, which handled the engineering and naval architecture and the interior design. Its official presentation is scheduled for the beginning of September during Ferretti Group’s Private Preview in Monte Carlo, before becoming one of the main attractions at the Cannes Yachting Festival in early September and the Fort Lauderdale International Boat Show, to be held in Florida at the beginning of November. 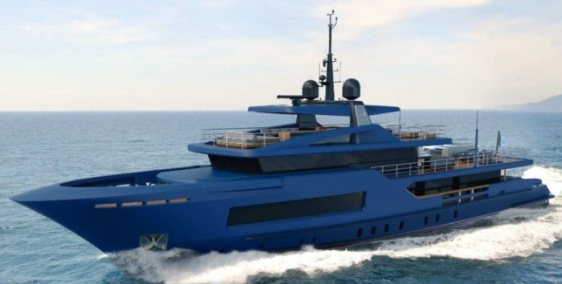 Baglietto presents an interesting project for a new 48m Explorer super yacht designed by its long time standing designer Paszkowski. A two deck and half super yacht based on a working style vessel, the 48m Explorer will feature guest accommodation for twelve persons plus two, including in this is a spacious owners stateroom, located on the forward part of the main deck. Crew accommodation is for nine including a captains cabin by the pilothouse up top by the bridge. Power for the 48m Explorer will come from Cats 1450hp or optional 2250hp units. Speed is 17 knots max with the large 2250hp Cats and a range of 5000 nautical miles possible at 10 knots. 48m Explorer will be build with a steel hull and alluminium upper structure. Stability will come from active fin stabilizers. Galeon's new 560 Skydeck is a model based on the 550 Fly launched in 2013 with a sportier profile and hidden next to invisible flybridge up top. New style sportier style windows, also add to a more aggressive profile on the 560 Skydeck. Details which differentiate this model from one of Galeon's best selling models above fifteen meters in the last years and offer it to different type of customers. The rest as should be expected is all the same with the very spacious interior with the impressive saloon offering three spacious double cabins including a full master owners stateroom. Two crew cabins aft are also included aft. The 560 Skydeck surprises for style and offers an L-shape settee and central console jockey style helm up top. Cranchi present the project for a new 50 S model part of its Hardtop range which starts from 38 and goes up to 64 feet and features seven models. The 50 S is to be based on the other project currently awaiting launch the 50 Fly, set to be presented at the fall of this year with the main difference coming from the hard top replacing the flybridge. The Cranchi 50 S although not officially shown should have a very similar layout as the 50 Fly, for both the main deck with astern galley being a prominent feature, and the lower cabin deck offering three double cabins with a spacious owners stateroom at midships. Power is from Volvo engines in 550hp and 600hp optional units coupled to IPS pod propulsion. Franco Harrauer born Milan in 1927 has left the World to a better place on 9 July 2016. Franco was a character from another time, one of those that leave you a sign, a smile. Even just thinking of him as a man, cartoonist, aerodynamics expert and an endless passion for the sea applying his expertise for hydrodynamic design into motor pleasure craft, and sailing. An expert all arounded, architect and eclectic narrator, has delighted over the years his attentive readers with lots of stories and even fictional anecdotes of the onslaught in the First and Second World War. Interesting are the materials applications used for his hulls, special care for trawler catamarans, the meeting with his friend and designer Renato "Sonny" Levi has led to some unique achievements in hull design. These include a unique and exciting World first sailing boat with planing hull: Exocetus Volants. Franco Harrauer holds numerous awards such as the Gold Keel and also patents that even today are a reference point. His most known collaboration with a still in existent shipyard was with Alfamarine where he designed among other models its still to date best seller 40 Bronte launched in 1975 and in collaboration with Renato Sonny Levi, and then all alone the one off 83 launched in 1986 and then 90 model launched in 1990. Both of which where flagships for the Fiumicino, Rome boat builder at the time of launch. 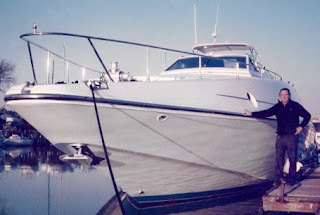 Franco Harrauer has in recent years published some interesting articles on the classic motor boat specialist blog Altromareblu of which I suggest anyone with interest in hull design and boat projects to read. A few days ago, Cantiere delle Marche launched M/Y Narvalo, a new 33-meter Nauta Air explorer super yacht built in aluminum and steel. Commissioned by a South American yachtsman, this new current flagship of the Marche yard will be showcased at the next Festival de la Plaisance in Cannes. Like all the boats Cantiere delle Marche builds, the three-deck, displacement hull of 108 Nauta Air is custom-made. The project is by Nauta Design, a celebrated Milan-based studio that also designed the largest private motor yacht in the world and boasts a number of collaborations with some of the world’s top shipbuilders. Nauta Design fitted the first 108 Nauta Air with a wide range of characteristics that maximize on-board comfort during the long cruises the owners of this kind of yacht have in mind. On the upper deck, just behind the wheelhouse, there is a sky lounge only a few square meters smaller than the main saloon. The deck also boasts more than 50 square meters of outdoor spaces, including a dining area and a well for a 5.5m tender that is possibly the best and most accessorized unit ever built by that company. The sun deck is a stunning observatory on the sea, an oasis for entertaining friends and guests equipped with a dedicated area for sunbathing, a whirlpool and a dining and cocktail area for refreshments. Its centerpiece is a strikingly designed bar, a true design statement around which the whole deck revolves. The lower deck comprises four guest cabins, all of which are of unprecedented size for this class of yachts, and an incredibly spacious lobby that provides guests with the perfect space for relaxing. The crew area features significant storage space and a sub lower deck entirely dedicated to provisions, allowing the yacht to remain at sea for weeks without the need to dock to resupply. The owners of first 108 Nauta Air love both a luxurious, elegant lifestyle and the great outdoors: combined with its signature style, the state-of-the art Hydrotec technical specifications of the yacht bridge both worlds, fulfilling the expectations of the most discerning clientele. Cantiere delle Marche Nauta Air 108’ applies the company’s know how to a class of vessels over 30 meters long, resulting in a seaworthy and over-engineered super yacht with a contemporary but timeless design, perfectly suitable both for a summer in the Mediterranean and blue water passages at extreme latitudes. 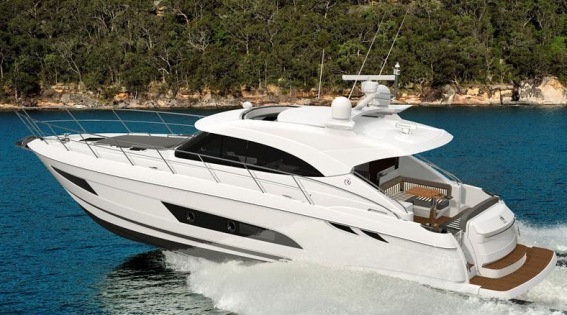 Trader presents an important uplift to its current best selling 42 Signature model. The new project gets the treatments for 120 new developed items on board, all designed to enhance the 42 Signature’s appeal as a passage making yacht and a home afloat. Highlights include new glazing, giving the best views afloat, and a docking joystick for unrivaled maneuverability. The rendering above also shows a change in the view hull windows with huge emphasis to the large size serving the master cabin located to aft. An other important change will be that concerning the master cabin to aft. The new generation Trader 42 Signature is set to launch at the 2016 Southampton boat show. Astondoa celebrates one hundred years in boat business in 2016, and what a better way to celebrate then to launch a new Coupe range with innovative and specific design features. The 655 Coupe is the first of this new range, which will feature three other models from 35 to 75 feet, all coming from the hands of Italian designer Christian Gatto. The project for the 655 Coupe was presented as 62 in late 2015, at that time the two dimension images showed a shaded appearance with a few different lines to an unconventional current sport yacht design. Now Astondoa and Christian Gatto break the mold of convention in what is certainly a new chapter. A fully enclosed hard top sport yacht the 655 scores points for looking very practical and usable also as a day boat, see walk around and center console feel cabin deck. Power for the 655 Coupe will come from the large Volvo 900hp engines coupled to IPS pod drives which will give a 33 knots max speed and a 26 cruise. Australia’s most-awarded builder of luxury motor yachts has just announced an inspired new addition to its growing Sport Yacht collection: the elegant Riviera 4800. With her World premiere scheduled for the 2016 Sydney International Boat Show this July, the impressive new 4800 Sport Yacht will appeal to a wide spectrum of boating enthusiasts. Riviera new 4800 Sport Yacht will feature a two staterooms and two bathrooms layout below deck, along with a lounging L-shaped sofa located in between the fore and midships cabins. Total berth capacity is five. Outside the new 4800 takes external design cues from the Riviera 6000 and 5400 models, which have been received very well since there launch and have a strong global demand. 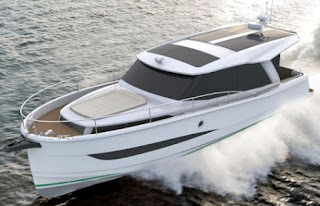 The 4800 as the larger Sport Yacht models will also feature a tender garage aft. Power for the 4800 Sport Yacht will also be a World first, as the new Riviera will be the first boat to be powered by the Volvo's new D8 600hp coupled to IPS800 IPS15 pod drives. Codecasa Shipyards are proud to announce that they have just launched their new Full Beam Vintage Series Hull F76. The launching took place on June 16 2016 at 10:30 am, at the Codecasa production facility in the harbour of Viareggio. Long time home of the family owned super yacht specialist Codecasa. This new Hull F76 was built following the tried-and-tested Codecasa 43 meters Vintage Series, already delivered in two other units. 43 FB differs as the model name says for having a full body interior from midships to the fore deck, which increases accommodation to the owners cabin located in this area. Interiors for F76 were designed by Tommaso Spadolini, in co-operation with the in-house Codecasa designers. The interiors feature light and natural tones of oak wood, stones and the fabric and an understated yet classy elegance being the keynote throughout. Codecasa 43 Full Body is equipped with two Catserpillar 1650hp and is able to reach a top speed of 16 knots in light displacement conditions as well as a range of 4,000 nautical miles at the cruising speed of 11 knots. She can assure a comfortable cruising in any weather and sea conditions, thanks to the high building standards, the large exterior spaces and the remarkable interior volumes, which are slightly under 500 tons GRT. It is interesting how Volvo has taken over the motor boat engine market in the medium large tier sizes in recent years. Till around the fifty feet size in the motor boat market currently the share is huge for the Swedish engine manufacturer, and the growing dominion coming from IPS is just increasing this. In all this it is important to note how Volvo grows its customer base with two important aspects; from smaller to larger engine sizes, and its find me everywhere service network giving a peace of mind to customers. Big contracts with the most known boat builders also help a lot. IPS makes also an important part of this growing market share, and here it is interesting to see the pod drive race with Volvo starting ahead in 2005, and ZF Zeus following up a few months later. The first years where not plain sailing for Volvo, from a point of view even more difficult to those ZF Zeus had, see forward looking propellers and need of a dedicated hull shape with a soft medium Vee aft. But in the end Volvo ironed out the problems and the IPS pod range today is complete and in adjacent with nearly all the diesel engines coming from Sweden. IPS unlike an engine can also increase size capability, and doing a larger pod drive is less technical then building a complete new engine in the larger horsepower capacity. A clever shortcut from Volvo which powers a few builders in the twenty meter yacht size today with just 900hp, from the likes of Absolute, and Sunseeker, to mention a couple famous names supporting the large pod. The IPS race was similar how Volvo took over the small boat inboard market with stern drive in the seventies. The World is different now, and Mercury reacted just couple months later with the ZF Zeus pod this time around, unlike what it did with the stern drive back in the sixties. Back then the US Giant went into a subterfuge media battle how the stern drive would not work. But the parallels are extremely similar how Volvo still succeeded with the World supposedly changing a lot since then.